Easy-to-use class for quick creation of rigid bodies with a OpenCASCADE shape. mass and moment of inertia is automatically set, according to the geometry in the OpenCASCADE shape. Get the COG frame with respect to the auxiliary reference frame. Get the auxiliary reference frame with respect to the COG frame. Build a rigid body with a different collision model. Return true if this body is fixed to ground. If true, the normal restitution coefficient is evaluated from painted material channel. If true, the tangential restitution coefficient is evaluated from painted material channel. If true, the kinetic friction coefficient is evaluated from painted material channel. Return true if collision is enabled for this body. Show collision mesh in 3D views. Return true if collision mesh is shown in 3D views. Return true if maximum linear speed is limited. Return true if gyroscopic torque is deactivated. Return true if 'sleep' mode is activated. Return true if this body is currently in 'sleep' mode. Number of coordinates of body: 7 because uses quaternions for rotation. Number of coordinates of body: 6 because derivatives use angular velocity. From item's state acceleration to global acceleration vector. From global acceleration vector to item's state acceleration. Takes the F force term, scale and adds to R at given offset: R += c*F.
Takes the M*v term, multiplying mass by a vector, scale and adds to R at given offset: R += c*M*w.
Sets the 'fb' part of the encapsulated ChVariablesBodyOwnMass to zero. Adds the current forces applied to body (including gyroscopic torque) in encapsulated ChVariablesBody, in the 'fb' part: qf+=forces*factor. 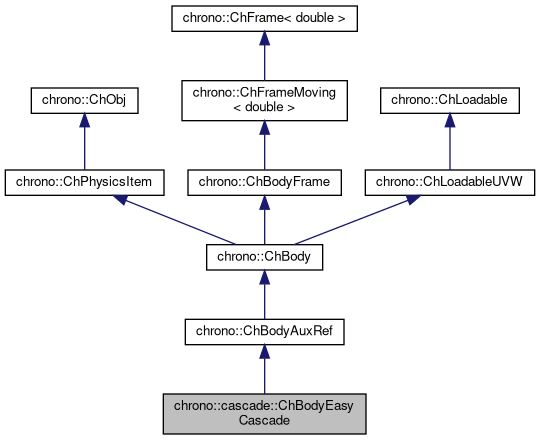 Synchronize coll.model coordinate and bounding box to the position of the body. Stores the current position in the last-collision-position buffer. Infer the contact method from the underlying material properties object. Attach a marker to this body. Attach a force to this body. Remove a specific marker from this body. Warning: linear time search. Remove a specific force from this body. Warning: linear time search. Finds a marker from its ChObject name. Finds a force from its ChObject name. Set the max linear speed to be kept for 'sleep_time' before freezing. Computes the 4x4 inertia tensor in quaternion space, if needed. Update all children markers of the rigid body, at current body state. Update all children forces of the rigid body, at current body state. Update local time of rigid body, and time-dependent data. Update all auxiliary data of the rigid body and of its children (markers, forces..), at given time. Get the resultant contact force acting on this body. Get the resultant contact torque acting on this body. Used by some SMC code. used when doing the 'recompute mass' operation. Creates a body plus adds a visualization shape and, optionally, a collision shape. Mass and inertia are set automatically depending on density. COG is automatically displaced, and REF position is initialized as shape location. Sphere is assumed with center at body reference coordsystem.